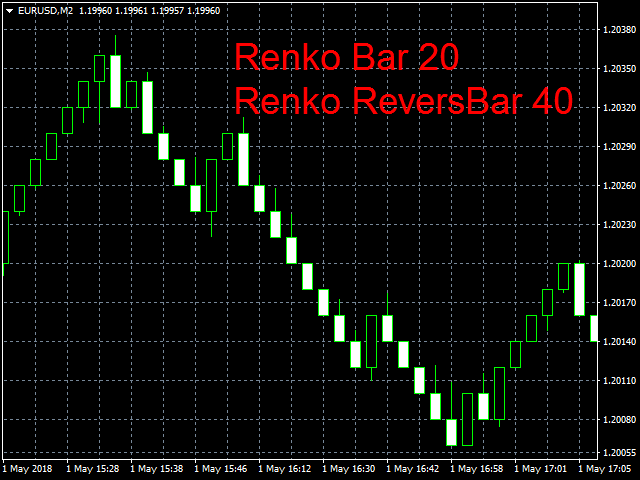 A chart created using Renko_One_ReversBar_Demo does not redraw the Open value of the current bar and the Close value of the previous one, which is important for a proper operation of indicators and Expert Advisors. Also the indicator enables testing of indicators and Expert Advisors in the Strategy Tester. To run your Expert Advisor on an offline chart, you need to create a copy of your Expert Advisor and insert or replace its OnInit() function with the one below. 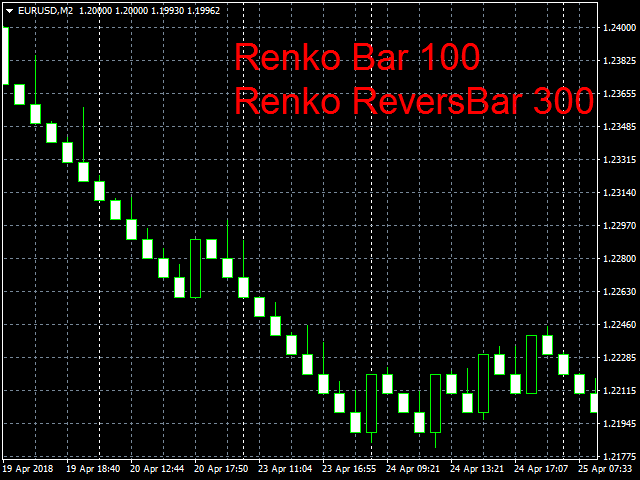 You may also use my refreshchart_and_tiks script, which allows running Expert Advisors on offline charts (this method is preferable, because you do not need to replace functions in your Expert Advisor). CandleSize - The size of the candlestick body, in pips. 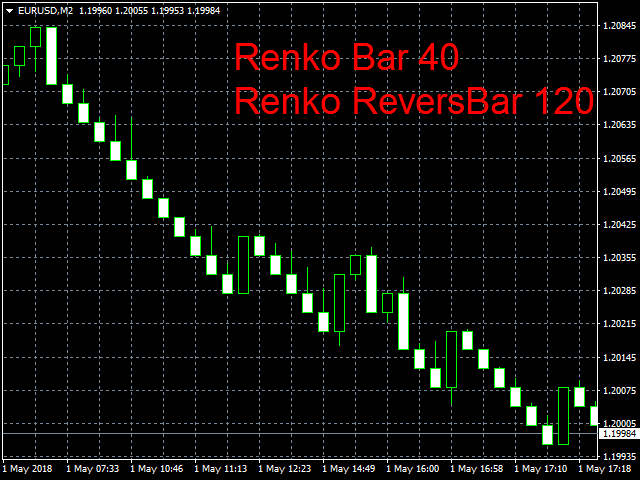 RevReduction - The amount by which the reversal bar increases. TimeFrame - Display on offline charts (M2, M3, M4, M6, M7, M8, M9 or M10). ShowWicks - Show shadows (true / false). StrangeSymbolName - Set true if the name of your broker's pair differs from the standard pair name. Test - false; True if you open a chart for testing. DateStart - Chart calculation start date. 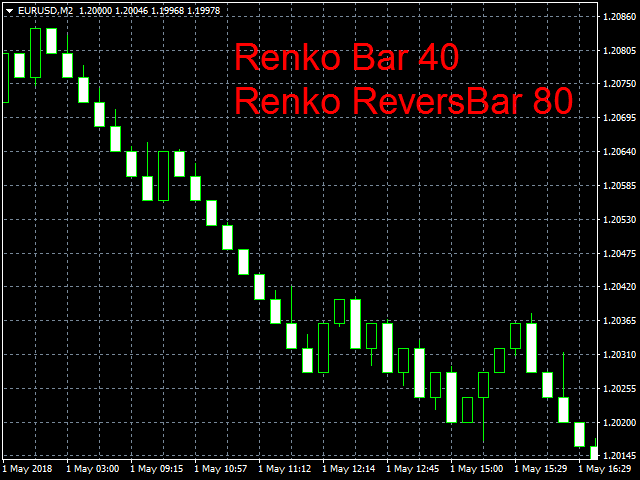 Watch the video of Renko_Bars_3in1 to find out how to set the indicator and to test your own indicators.